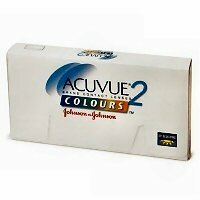 Find non prescription colored contact lenses online plus advice on what you need to know before ordering. Why on earth would you want to put pieces of thin plastic into your eyes if you have perfect vision? To change your natural eye color of course! And what a difference it can make! You can have piercing blue eyes just like actor Daniel Craig (aka James Bond) using color enhancing contact lenses, or completely change your look with a transformation of eye color from green to brown or even purple, using one of the latest fashion colors. ...and fashion is what is driving the current trend for non prescription colored contact lenses as you don't actually need to wear lenses for vision correction to buy them. You do need to understand a few things before rushing out to buy contact lenses without a prescription. Contacts don't come with a one-size-fits-all tag; they have different sizes, known as diameters (the width of the lens) depending on which brand you choose. NB: This is why you MUST visit an optician to have your eyes tested and FITTED - EVEN IF YOU HAVE 20:20 VISION! Otherwise you won't know which size of lens to order. If you buy a lens that is too wide for your eye shape, for instance, it will feel uncomfortable and may well put you off wearing contact lenses completely. The most popular non prescription colored contact lenses are soft disposable lenses, as these are the easiest to get used to for occasional wear purposes; many people use these so-called fashion lenses to change their appearance on a daily basis so they don't want lenses intended to be worn for up to a year. Acuvue make really comfortable 2 week disposable colored lenses available in both prescription and ZERO prescription form ie. the lenses don't have any corrective power. for people with dark or light eyes. If you have dark eyes, color enhancing lenses won't work as you can't see much of a difference versus your natural eye shade. Want to try these lenses? Save an extra 10% on already low prices with these special contact lens coupon codes from AC Lens. The other most popular brand of colored contacts is Freshlook. These disposable lenses come in a variety of types; Freshlook Colorblends come in 12 different shades including amethyst and sapphire and there are also Freshlook TORIC Colorblends, for people with astigmatism. Freshlook Dimensions are color enhancing lenses for those with pale colored eyes and Freshlook ONE-DAY is the first daily disposable colored contact lens - the best way to use and try colored lenses as they cost just $14.95 for a box of 10 lenses. Be careful with daily disposable lenses, however, as they are very thin and easily torn as you try to fish them out of the tiny box they come in; a difficult task for anyone with big hands and fingers! By the way... remember to get those eyes tested first! Of course if you are going to try cosmetic non prescription colored contact lenses, don't just think of them as fashion accessories. You should never share them with your friends for example - this could lead to serious eye infections! Plus you MUST clean and disinfect your lenses using contact lens solution EVERY TIME YOU WEAR YOUR LENSES. Again, if you don't, you may get an eye infection and, while this may lead to a natural eye color change - your eyes will be red and itch a lot! - let me assure you it is NOT a pleasant experience.